Well, I'm back in the sandpit. After being away for two whole months, I just didn't want to come back! As cliche as it sounds, time flew by so quickly, but the memories that were made will last me a lifetime. Despite my parents having lived in Trivandrum for just over 10 years now, I still have no idea on where to eat or shop while I'm in town and usually rely on friends for recommendations. Imperial Kitchen came up with huge praises and so on a free night, we made our way over for dinner. The location is terribly easy to miss and I've driven past without noticing the restaurant. 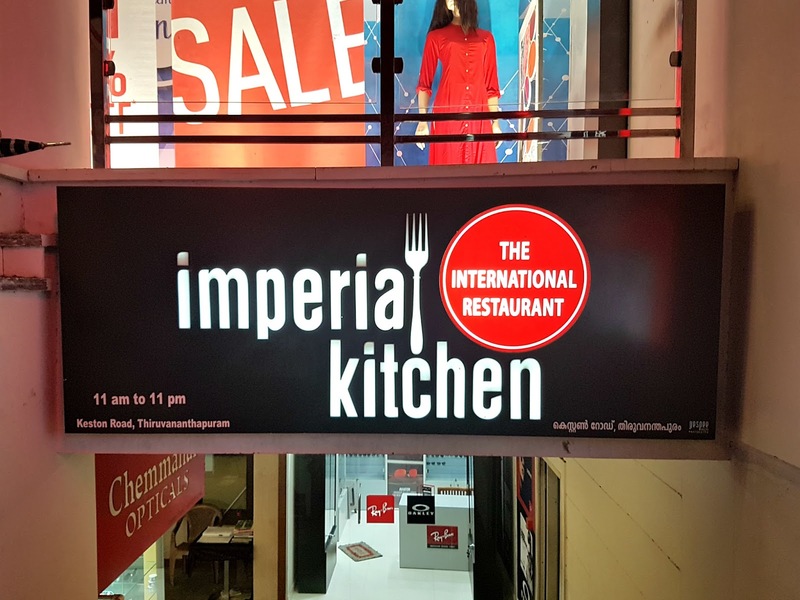 Imperial Kitchen is located in a basement right next to Style Plus which, correct me if I'm wrong, was one of the first air conditioned stores in Trivandrum. Used to be a hangout place during my college days when we were in town for in-plant trainings during the semester breaks. Sure brought nostalgic memories being in the area after so many years! Click (here!) for the location on googlemaps. The restaurant was crowded and noisy, but that only proves that the food will be good! Prices are reasonable too, maybe a little on a higher side, but still definitely affordable. Service was slow, understandable, almost every single table was occupied and on a weekday too! It took forever for our waiter to come and hand us menu cards and while ordering apart from answering questions, he didn't make any suggestions. He was a delight with the kids though and kept entertaining their requests for more and more balloons. The kids chose the Margherita Pizza (Rs. 280) and we were brought a large pitta like bread smeared with a little tomato sauce, topped with cheese and tomatoes sliced so big that they were still undercooked. Great for deluding the kids into thinking that they're eating pizza, but this without a doubt doesn't deserve to be on the menu. We started with the Imperial Grill (Rs. 980) and it was served with kubboos (Arabic bread) and a selection of different Arabic salads (below). 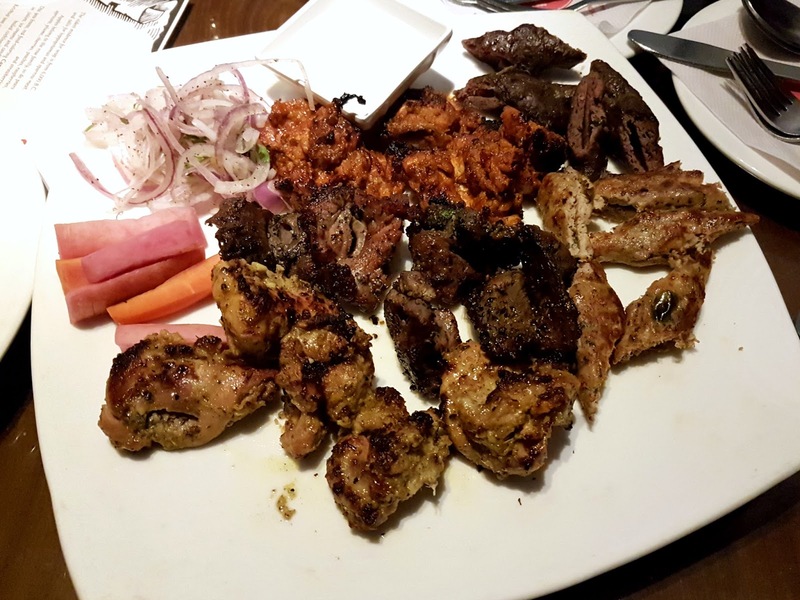 The platter contained a selection of various kebabs and tikkas, obviously Arab inspired, but there was a lovely Indian touch to each of the meats. Loved every bite and would definitely reorder. For mains, we kept it simple with two types of fried rice. We went with the regular veg fried rice (Rs. 140), standard, and for some unfathomable reason, my brother in law decided to try the Jakarta fried rice (Rs. 190). I would never have picked it from the menu, but it was delicious! There was this beautiful yet inexplainable flavour infused throughout the dish, a winner in my books. We also ordered the Sliced Chicken in Hot Garlic Sauce (Rs. 280). Hot and garlic in the title was what attracted me to this, but the dish was underwhelming. There were only very subtle hints of heat and garlic within, and it was just a large mass of thick underseasoned sauce with very sad looking morsels of very dry and overcooked chicken. Bleh! 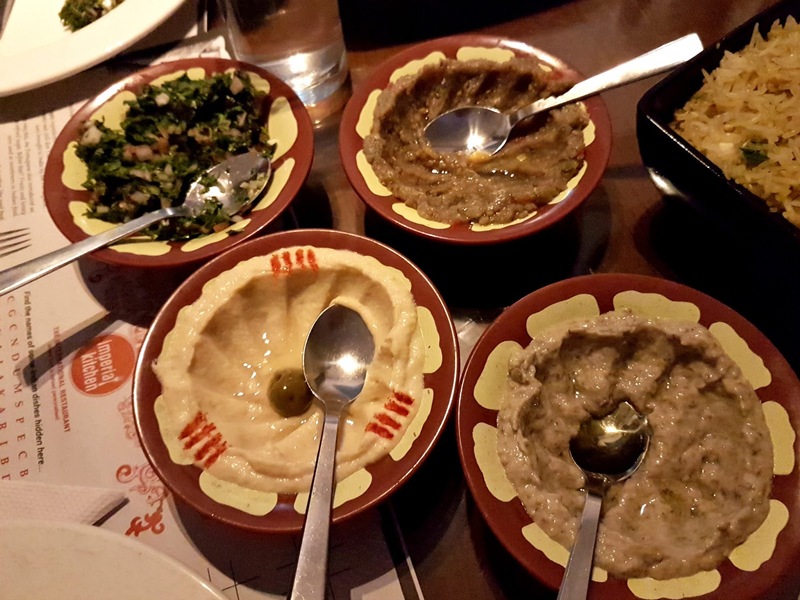 Overall a mixed bag of dishes. 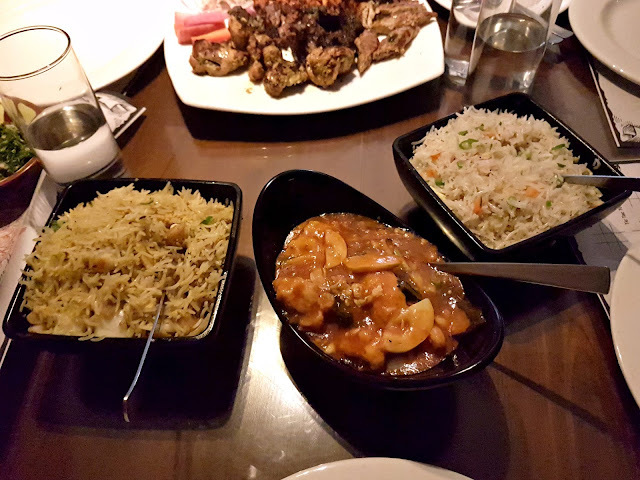 The platter and the rice dishes were my favs, but avoid the chicken and pizza like the plague. Will definitely be back next time to try more of their dishes however. Click for their online menu and here's their website. Welcome back Mimi! Glad to hear of your experience at this restaurant. 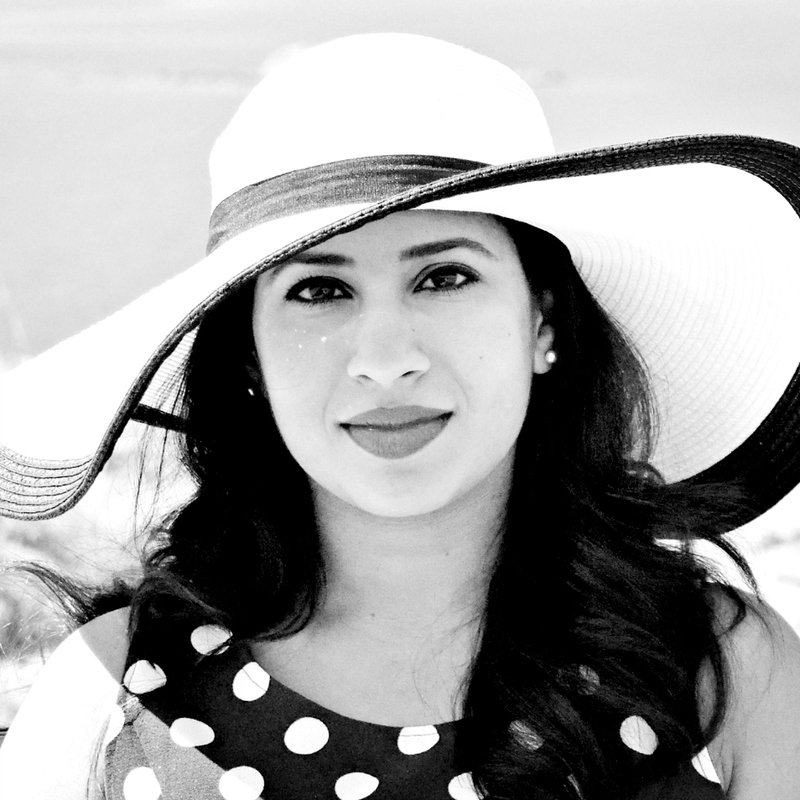 Waiting to read more from you as you are back in Kuwait now. Hey Sonia! It is always good to hear from you. Yup, glad to be back too! Any luck with your license? Hey Mimi, Am glad you remember me :) Well unfortunately nothing new regarding my license. Kinda contemplating if i should go through the trouble as the system is really screwed up here. 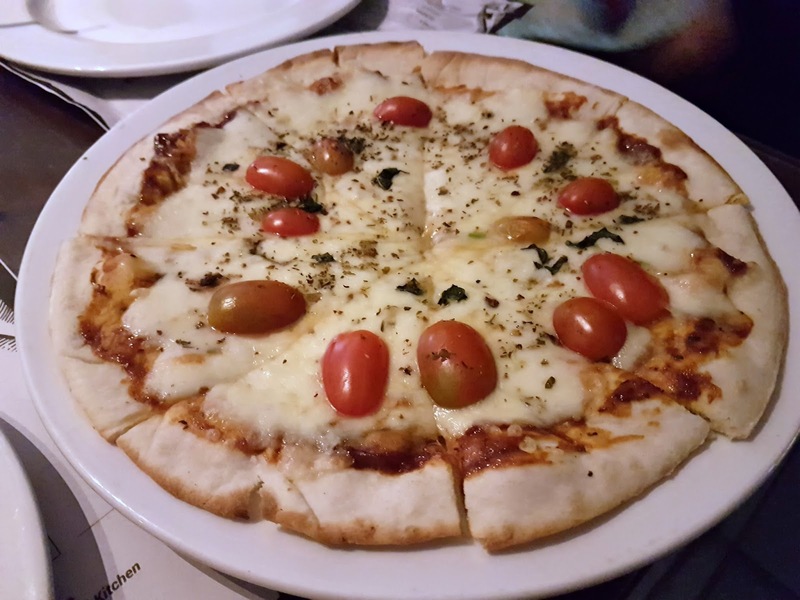 Hi Mimi, welcome back, the restaurant is looking nice and dishes too, I think you had a great time in Trivandrum and this restaurant, I am Pizza lover, Pizza looks just superb and tasty. Hey! Thanks, was a great restaurant and I loved most of the food we tried. I love pizza too, but this one just doesn't qualify to be called a pizza unfortunately. Oh well. If you havent been to Villa Maya , you should give that one a try too ! Its a very popular place in Trivandrum . YES! I did actually go to Villa Maya, after so many recommendations from friends, I just had to try it out. I went for dinner though so I wasn't able to enjoy the beautiful garden as much, but we had a great time! Took a little tour through each of the rooms too. Should write up about it next. Oh you should definitely go there for lunch next time! The outdoor seating area looks lovely in the afternoon, albeit it does get hot! Hi! Oh wow, thank you so much for stopping by! Yes, I will definitely be visiting again during my next visit to Trivandrum.